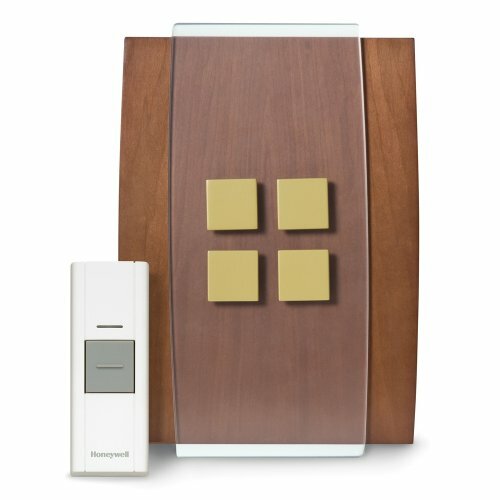 A simple contemporary design combining natural wood and glass materials mark this Decor wireless chime from Honeywell. Hang this chime vertically or horizontally to fit your style or cover up existing holes. This premium door chime works with up to six (6) push buttons, motion detectors, or window and door contacts for added security, or motion detectors for peace of mind inside and out. The RCWL3506A also features six (6) selectable chime tunes, fully adjustable volume, CD quality sound, and low battery indicators on the push button and the door chime. Enjoy a stylish addition to your home decor with a premium decorative door chime from Honeywell.